Clifton Surrey is a unique and exciting garden centre in green and leafy Surrey, with a stunning contemporary show garden. Well known for its comprehensive range of large trees and shrubs and its extensive range of pots and planters, Clifton Surrey also offers stylish luxury garden furniture and a wide choice of quality BBQs, smokers and pizza ovens. With an impressive offering including probably the best range of tall evergreen trees in the south east, Clifton Surrey is the ultimate destination for instant impact plants. Whether looking for shrubs, hedging, trees, topiary, climbers, palms, grasses or perennials – our range of large plants is unparalleled. Alongside this plant range we also offer an exciting range of pots and planters, in all shapes, all materials and in all sizes ….. from large to enormous! 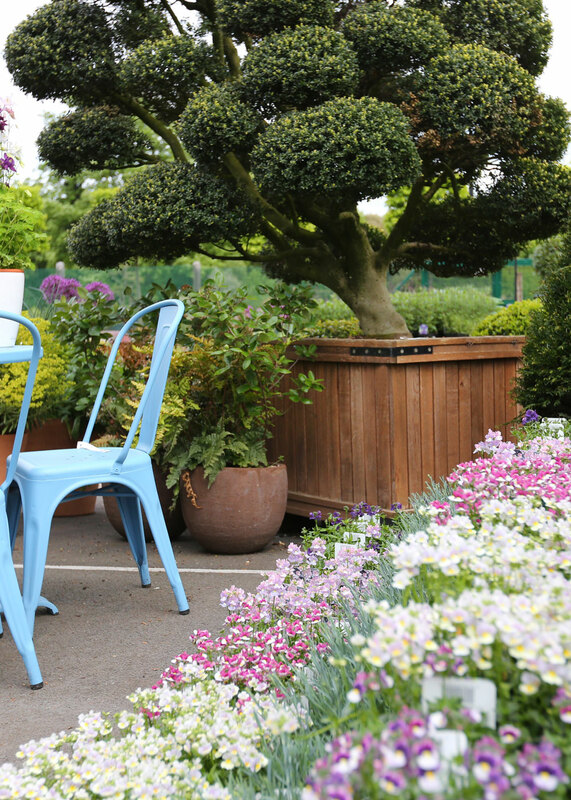 Determined to assist you in embracing the outdoors with style, our centre at Clifton Surrey stocks a wide range of quality luxury garden furniture for dining or relaxing in the garden. At Clifton Surrey we’re also passionate about outdoor cooking and our extensive range of outdoor cooking equipment will truly ensure that eating outdoors has never tasted so good! Frequent outdoor cooking demonstrations provide the opportunity to tantalise your tastebuds. Proving very popular with visitors is our onsite contemporary show garden, designed and built by our talented inhouse team of designers and landscapers. Based on the theme of ‘bringing the indoors outdoors’, this garden includes a ‘living room’ and stylish outdoor kitchen, all softened and bought to life by some creative planting. And nestled among the plants, overlooking the show garden, is our new Quince Tree Café offering the delightful combination of plants and patisserie. We pride ourselves on offering you a unique and extensive quality collection of plants, pots, BBQs and outdoor furniture – none of which would be possible without the skills, expertise and hard work of our experienced and enthusiastic buying team. When we source plants and products for Clifton Nurseries, we go to great lengths to ensure that anything we buy conforms to some basic but very important standards. Firstly, we want to ensure that we offer you great value for money, an essential requisite in all walks of life. We also ensure that anything we offer is of superb quality – we’re renowned for the excellence of our plants and products and for a very good reason. If a product is designed to do a practical job, we insist that it does it really well – no point in having a garden spade that you can’t dig with – or if it really is simply there to be beautiful, we insist that it’s as beautiful as possible. And last, but by no means least, we aim to offer you those items that aren’t readily accessible elsewhere – we don’t want to just offer the same as everybody else, we aim to offer you plants and products that are just that bit different, in many cases unique .… just like you! Here at Clifton Nurseries we're passionate about our plants and take pleasure in personally selecting plants from the best growers all over Europe. Whether it be through our two centres at Clifton London and Clifton Surrey, through our Clifton Nurseries online shop, or through our garden design, landscaping and maintenance services, you can rely on us for the very best plants, products and services. You deserve the best; we deliver it.